Two girlfriends and I went to a “paint your own pottery” store last week and this is what I created. Does it look like a grade school project – possibly – but I had SO MUCH fun doing it I don’t really care! It’s mine and I made it and I can’t say that for most things. My kitchen is accented with bright colors – I collect vintage ‘50s Pyrex bowls – so my wall color and wall paper could be described as “retro.” I have a bright green accent wall covered with plates I’ve collected at antique stores – this will now find a permanent place among my collection. Painting pottery is now a monthly date. 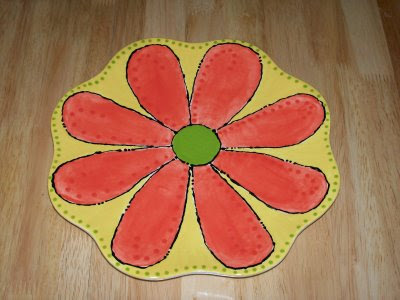 your daisy plate is fabulous and I had a swell time painting with you! What should we make next month?